A cheerful ambience, cool cocktails, ladies nights and karaoke, this place has Mexican vibes and fusion food. JP Nagar has got swag! The Mexican Style – A tequila based drink with green chilli, lime juice and lemonade. 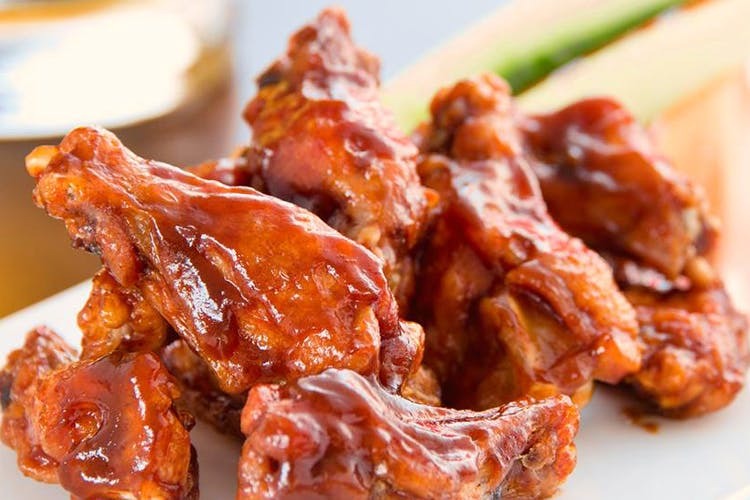 An entire section dedicated to chicken wings – from lollipops to tenders that are simple and crunchy. A chic cafe with a diner vibe, with seating booths as well as an alfresco seating, this one keeps it casual. Most of the events happen in their outdoor space. But if you’re here for drinks, hang out in the al fresco area or indoors. A lot of popular Indian and continental dishes, with a Mexican twist, there is much choice for vegetarians as well. The burgers range from the classic grilled chicken to new-age beet burgers with a beetroot patty. The rice dishes are cooked with fish, calamari and prawns, and will fill you up nicely. For the taco lovers in the house, choose from chicken, veg or shrimp. Can’t decide? Have a platter and get to relish it all. For the ultimate experience though, sample their sizzlers served with potatoes. Don’t leave without eating the Khara Fries With Cheese. It’s sinfully fried fries, doused in a piquant Mexican Chipotle chilli with melted cheese poured over it. Yum! While it isn’t wowing with flavour, it’s the choice that keeps us coming back. Plus, the cool events to keep you entertained. During their weekly events, the whole space has a pumped up party setting. Make sure to check with the staff on what event is on, in case you are looking for a quiet evening.